We are entering a price range where a lot more can be demanded both in terms of performance and design. Not only do these subwoofers sound far better than options at $300 and $200, they also enhance the feature set as well as go more in-depth in terms of design. The models in this category step out of the value realm, into a more premium design. While not the cream of the crop, these are all excellent subwoofers that ooze quality in every way. High quality MDF cabinet that ties down acoustics. A massive 10" cone which is super responsive. State of the art 300 Watt RMS DSP amp. Peak power maxed out at 700 Watts. It is a massive subwoofer which requires plenty of space. Higher end subwoofers tend to be designed for more than just good performance. When you start investing this kind of money into your gear, convenience also becomes a factor. SVS PB-1000 is one model where this is pretty obvious. 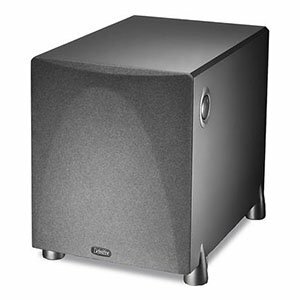 It is a highly capable sub that features great build quality and functional design. On top of that, it looks great. The hardware inside comes down to a 10″ woofer cone that is paired with a 300 Watt RMS amp whose power peaks at 700 Watts. That is a pretty wild power rating for a home theater sub. Needless to say, the quality of sound is quite impressive. You can feel the massive low end no matter what you’re listening to. One of the most attractive subwoofers on the market. Comes with a highly responsive 6.5" cone. Features a quality 100 Watt amplifier. Good set of acoustic controls and features. Not the most cost effective solution in this segment. Many wonder what makes higher end subs so different from their more affordable counterparts. We feel that REL Acoustics T/Zero offers a good answer to that question. 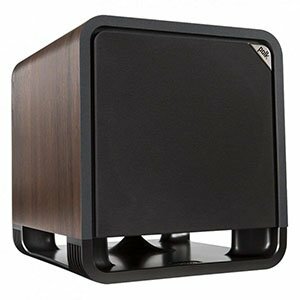 It’s a very stylish subwoofer which feature a pretty unique design. You can tell that REL Acoustics thought about the aesthetics as much as they did about the performance of the sub. Its gorgeous looks are just the half of the equation. The other half comes in form of a stunning 6.5″ cone sitting at the bottom of the cabinet. This is a down firing sub with a 100 Watt Class D amp. Sounds underpowered, right? Not necessarily although you are paying a premium. T/Zero does a great job overall. A functional design which packs a lot of power. Massive high excursion woofer capable of moving lots of air. BASH amplifier capable of delivering 200 Watt continuous power. An array of Bluetooth features and other awesome tech. No hardware acoustic controls available. 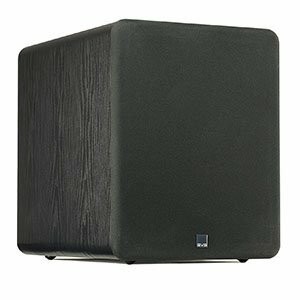 ELAC Debut 2.0 SUB3010 represents the new variation of an already prove design. It is a simple looking sub, but one that features some unique design solutions. On top of that, you are also getting a very functional set of features and tech. All things considered, it is one of the most convenient subs in this category for sure. 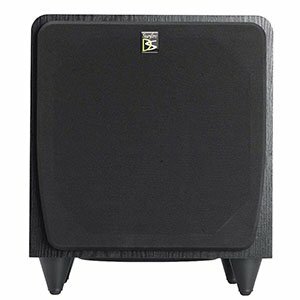 What defines SUB3010 is definitely its 10″ high excursion woofer. It is a fast moving transducer considering its size. The fact that it’s wired into a 400 Watt BASH amplifier also helps out a lot. Aside from raw power, SUB3010 also features stuff such as App Control, Automated Room EQ, Bluetooth control and more. It’s a powerful and practical sub. Comes in a sturdy, stylish cabinet that looks great. Features a well balanced 8" polymer cone. The built in amp offers 300 Watts RMS. Plenty of headroom makes it a competitive rig. Its size can prove to be an issue for some. The sub features a 8″ polymer cone that is powered by a 300 Watt RMS amplifier. In terms of frequency response range, you are looking at 20Hz to 150Hz range. That is pretty good all things considered. On top of that, the 8″ infrasonic radiator also helps add more definition to the sound. Overall, it is a pretty great choice. A stylish, old school cabinet design which fits in anywhere. Features a massive 10"front firing cone. Built in amp that packs plenty of power and headroom. Comes packed with great features and acoustic controls. It's large unit which may be an issue for some. In a market saturated with all kinds of advanced designs, sometimes it is best to simply stick to basics. Sunfire Dynamic SDS-10 offers that type of experience at a very competitive price. We’re looking at a standard cabinet design with a front firing transducer configuration. In terms of aesthetics, it features a more classic look that works pretty much anywhere. Underneath its cool exterior hides a 10″ woofer cone complemented by a down firing passive radiator. The speaker is wired into a powerful Class D amp capable of delivering some 250 Watts RMS. Needless to say there’s plenty of headroom with this one. The acoustic room controls, the built in crossover and more, make this a proper choice for anyone. A stylish cabinet which is all about simplicity. Comes with a responsive 8 inch cone. Great power output and management. Features intuitive controls and room acoustic technology. Larger than most down firing subs. Properly designed down firing subs were always a good alternative to the more conventional designs. 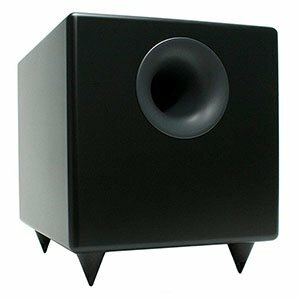 Audioengine S8 is a straightforward sub that features this alternative design. 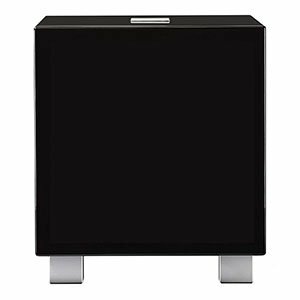 What we like about this particular model are its clean looks which allow you to blend it into any home theater system. If looks are important to you, this sub is worth checking out. In terms of hardware, you are looking at a 8″ cone in a down firing configuration which is paired to a powerful amplifier. The overall frequency response range you have access to goes from 27Hz to 180Hz. That makes it a pretty competitive and capable model to say the least. Overall, S8 brings a great combination of features and performance. Good bang for the buck value. Stylish cabinet design which gives it character. Great assortment of hardware and amps. Comes with all the controls necessary to customize its sound. This is a pretty massive unit. Last but not the least we have an awesome Polk Audio sub to show you. It goes under the name of HTS and it packs a whole lot of bang for your buck. As you can probably tell, the cabinet isn’t your standard one. Instead, Polk Audio went with a more interesting design which definitely adds to the overall aesthetic. HTS features a front firing long throw woofer that measures 10″ in diameter. The obvious down firing component is actually the bass reflex port. In terms of power, you are looking at 200 Watts coming from a fine Class D amp. On top if tall, HTS offers plenty of tone shaping and room acoustics controls. Overall a pretty awesome package. At $500, these are some of the best subwoofers out there. Period. While value doesn’t play as much of role as it does at lower price points, performance wins out and easily justifies the cost. That also means that these aren’t for everyone. Instead of trying to be the most intuitive, the models here are geared more towards enthusiasts. For that money, you more than likely are interested in audio and we took that into consideration when evaluating which subwoofers are good at this price. Subwoofers in this category really step up the feature set, bringing practical features to a table that make a serious difference in context of a full system. Of course, internal features are expected and add serious performance buffs, but external features are the focal point here. 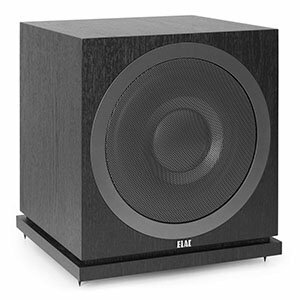 Things like remote functionality, room tuning, and more show up, proving these are subwoofers that are made a cut above. The feature sets are all different, so you’re going to have to do some research to find the one that fits your needs. However, a trend that follows with all of them is a high headroom amplifier. 300W minimum RMS with dynamic ratings that easily reach into the 600W range mean that all models listed here can not only be turned way up, but also be incredibly clean at low volumes. Continuing with the trend of more expensive models, the ones at this price point distance themselves from each other vastly in terms of design. However, one thing remains; they are all beautiful. It’s clear, at this price, the products have been designed with aesthetics in mind. Gorgeous woofers, intuitive design, and clean edges all lead to some really good looking masterpieces. There are issues, though. With such ventures out of a stock design, these subwoofers won’t integrate with all systems perfectly. Still, if you’re dropping $500 on such gear, you’ve probably thought through the look of your whole setup. For $500, you get incredible performance, rock solid build quality, extensive features, and gorgeous design. Each of these options feel premium, not making you feel robbed of your money. For enthusiasts that don’t want to go overboard, this is an excellent price point, granting all of the things that are important to those who care about their audio without going too deep into the points of diminishing returns. No, the point of diminishing returns are strictly reserved for subwoofers at the $1000 price point.